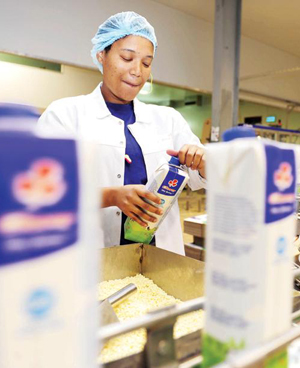 Clover's R439m impairment of a loan to its subsidiary the Dairy Farmers of South Africa (DFSA) hurt earnings, leading to the resignations of top executives of the group's milk producers business. The company reported a headline loss per share of 23 cents for the year ended June 30, down from 64 cents a year ago. Despite the impact of the drought, resignations in key positions of DFSA executives, decreased consumer spending and rand volatility which eroded discretionary consumer spending, revenue was up 7.9% to R8.3bn. DFSA incurred a loss of R128.8m, which the company attributed to the loss of milk surpluses. It said this was stimulated by "higher milk prices paid to milk producers from July 2017 through to December 2017 as well as favourable weather conditions over most parts of the country during the summer months". The losses were compounded by the influx of cheap imports of UHT milk. Previous financial statements showed that DFSA had been see-sawing between loss and profit from 2012/13 to 2016/17. However, the challenges have led to the surprise resignation of DFSA CEO Louis Botha on September 11. “His decision to resign is understood to be as a result of the enormous conflict between losing milk producers or losing market share during what has been a very challenging time for the dairy industry generally,” the company said. The company said sales of its products increased by 10% under a challenging domestic market, which saw growth in product sales achieved through increased volumes in fermented products and desserts, which grew by 25.7%. A shortage of butterfat during most of the year led to above-inflationary price increases for butter, while volumes in cheese increased on the back of no price increases. Cost of sales increased by 6.9% to R345.4m, compared to the previous financial year, while cash generated from operations, before working capital changes, totalled R769.5m, up from R439.2m. Clover said the one percentage point increase in VAT and the implementation of a levy on sugary products had placed a “further strain on consumers' disposable income”. Economic pressures saw a shift in consumer spending patterns, as shoppers bought more products on promotion, putting pressure on historically premium branded products. "This created an environment of fierce competition among fast-moving consumer goods companies to maintain and grow volumes." Clover recently added new products to its range such as Numel, Sip Up, Snack Pack, Cream O'Naise, Whistling Chef, Bliss Yoghurt Double Cream as part of its strategy to diversify from low-margin consumer foods.